With the second part of this DVD double-header about to hit the shops it would be remiss not to review this informative and interesting archive of the early days of the Los Angeles music scene. In today’s post-internet, hugely globalised metal market it can be easy to forget how insular the world was back in the late Seventies and early Eighties. Basically, if you lived in the UK and didn’t read about it in Sounds (or Kerrang!, come 1981) you didn’t find out about it at all; and so when the US metal scene reached critical mass sometime around mid- to late-1983 and all these overnight sensations suddenly burst through onto the world stage, most UK fans really had no idea how hard and for how long many of the musicians had been struggling to get noticed. The pair of DVDs that make up ‘Inside Metal: The Pioneers Of Los Angeles Hard Rock and Metal’ does a damn good job of rectifying this. Certainly, what we probably failed to appreciate on this side of the Atlantic is just how many times the likes of Paul Shortino, Don Dokken, Steve Plunkett and so many others crossed paths with each other in the hope of making it to the big time. 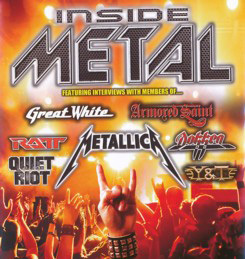 Through frank and hugely entertaining interviews with many of the big names on the scene at the time the two DVDs truly breathe life into a fascinating period of metal music history. The first part in particular throws up some great quotes, in particular Don Dokken’s appraisal of Eddie Van Halen’s guitar technique; having humorously lambasted young Eddie for breaking all the ‘rules’ in terms of how the instrument should be played Dokken then concedes that seeing him play made him realise that it was “over for me as far as being a guitar player was concerned”! Although some of the interviewees might not be so familiar now they were all key players at the time and the stories they relate are quite fascinating at times. Maybe it’s just me, but I love to know how and why things happened, and don’t forget that one man’s piece of trivia is another’s nugget of gold. I’d have to dock a point for the narration on the second DVD saying how there was a lot of influence from the New Wave Of British Heavy Metal and then citing Iron Maiden, Saxon and Def Leppard as the leaders of the movement alongside “metal veterans Judas Priest and Motörhead” (it’s seemingly a common error in US metal circles to lump those two bands in with the bright young hopefuls of the NWOBHM) but that’s maybe a minor quibble from someone who’s perhaps too enraptured with the movement for his own good. The series is an enthralling insight into how US metal came to straddle the world, and besides, it’s almost worth the price of both DVDs alone to hear Michael Des Barres of Silverhead and Detective likening parts of the Seventies’ L.A. scene to the flamboyance and culture of the likes of Byron and Shelley. “I felt like a romantic poet with a slide guitar,” he laughs. Not a bad way to be remembered, eh?